iOS 6 Maps. An unmitigated disaster, right? That’s what I’d say as I struggle to get Maps to even give me correct directions from work to my house, but apparently, I’m in the minority: a recent poll suggests that most people don’t think Maps has degraded at all in iOS 6. The survey was conducted by Mike Blumenthal using the Google Consumer Surveys tool. There weren’t a lot of responses — only 168 — but of those polled, over 50 percent thought it was a non-issue, while an additionaly 23% thought it was firmly good enough. Astonishing. Of those who responded, women were less likely to find iOS 6 Maps wanting than men, and city dwellers tended to be more happy than users in rural areas (this makes sense, as the data of major cities tends to be in better shape than for obscure country locales). 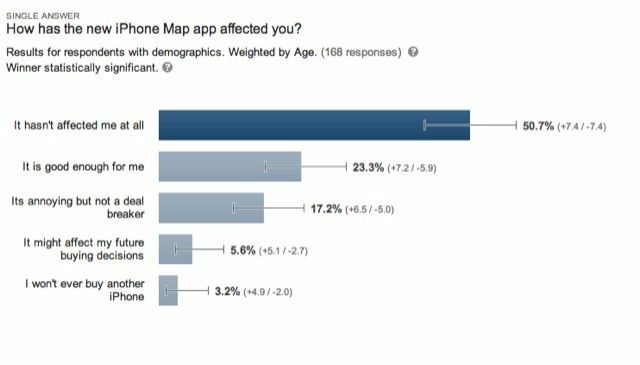 At the end of the day, only 8.8 percent said that iOS 6 Maps had measurably changed their likelihood of buying future Apple products. In my mind, that’s still a pretty alarming number, but it’s certainly not a catastrophic one. People aren’t going to flee the iPhone for Android in droves because of Maps. In my experience, the people who have no problem with iOS 6 Maps are people who don’t rely on Maps very often, and when they do, are always driving and in a car. I am an urban dweller, and live in a city where Apple’s mapping data should be pretty good, and for me, iOS 6 Maps is so consistently terrible that I’ve been reduced to the point of gnashing my teeth as, time after time, Apple tells me that an address I want to go to in Somerville is actually in Belmont, several miles away, or that directions to a shop around the corner on foot require me to make a long, pointless series of spirals. What about you?